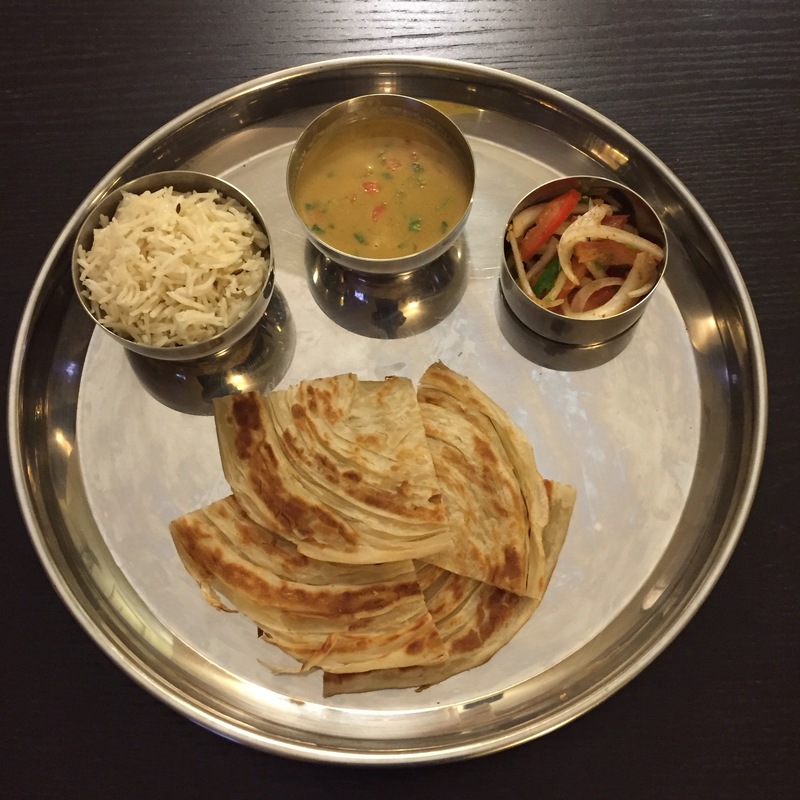 Parotta is a very delicious flaky layered flat bread and it is served with this rich tomato based gravy called Salna. 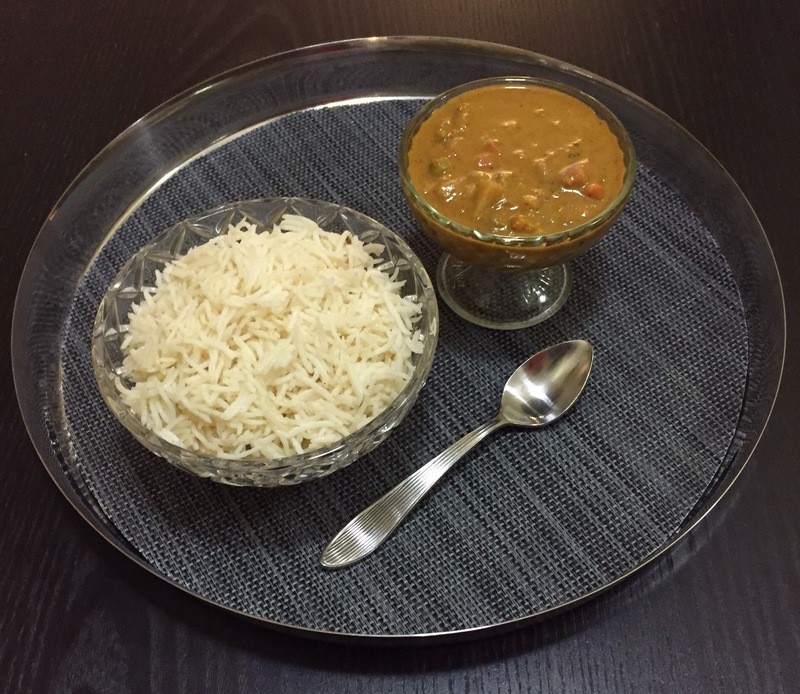 This is a yummy combination which is favored by all in my household so this is always in my weekend dinner menu. In my home town in India, there is a small road side restaurant which opens only for dinner and serves nothing but this parotta and salna. They don’t even have a proper building or a name they just put up a tent in a parking lot with some picnic tables and chairs, so there is always a huge line to eat here. Since the food is so good they literally sell out in a couple of hours. People from the neighboring cities visit our town just to taste this. 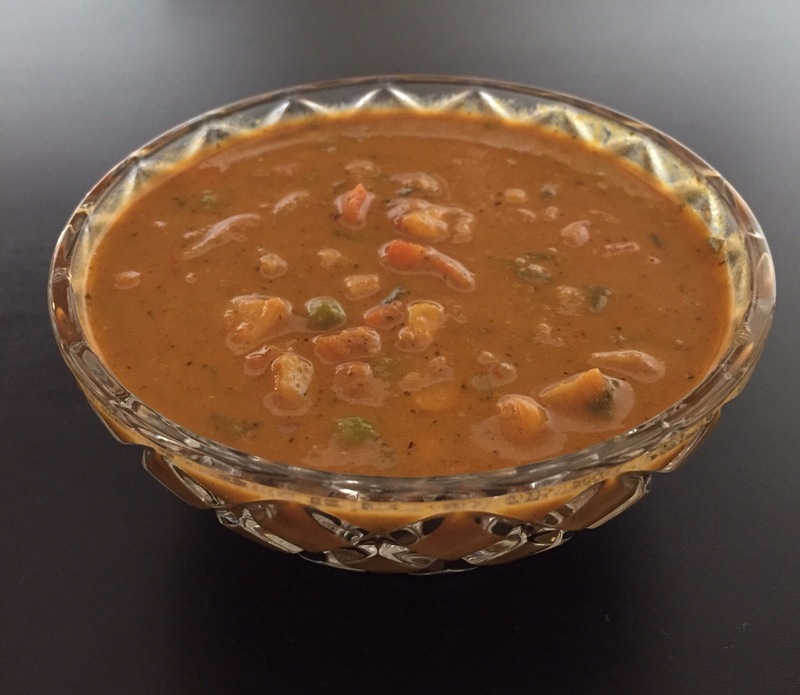 Salna is very flavorful tomato based gravy thickened with almond powder or cashew powder. The versatility of this dish is amazing, you can make the Salna with mixed veggies, fried paneer, tofu or soya chunks. You can have this with pilaf or any other choice of flat breads. 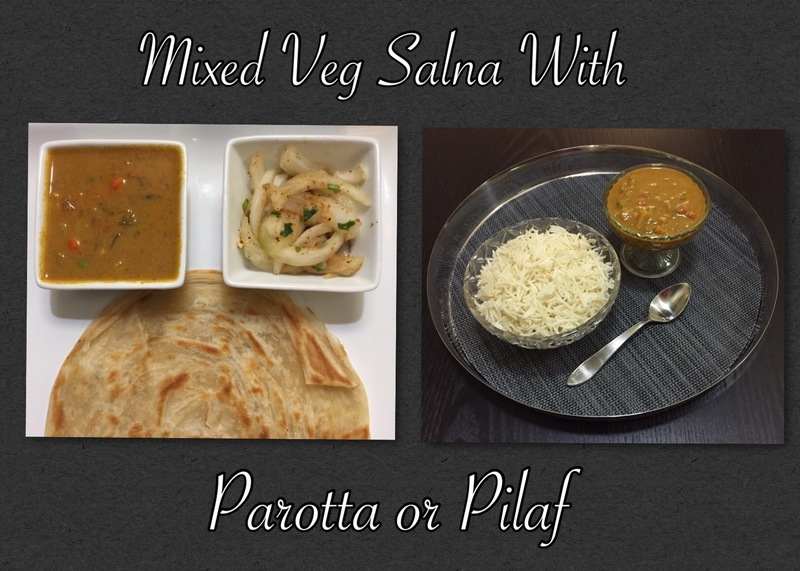 I’m happy to share my version of this very delicious veg salna. Fresh cilantro and lime for garnish. Heat little bit of oil in a sauté pan add fennel seeds, cinnamon , cloves, cardamom and pepper corns. Do not add bay leaves with this. Use the exact amount of whole spices I have given, if you add too much it gets very intense and makes the gravy slightly bitter. Once the spices are toasted add the onions and sauté them until it’s soft. Add the chopped tomatoes, sauté it until it turns mushy, if you close it with a lid it turns mushy very quickly. Now add the powdered spices turmeric, coriander, cumin, chili, mint and almond powder and sauté them for a couple of minutes until it thickens up. If you don’t have dry mint leaf powder you can add couple of fresh mint leaves. Now add 1/2 cup of water and grind it into a smooth paste and keep it aside. Dice the carrots and potatoes as the same size as the peas and corn so they cook evenly. You can use either fresh or frozen peas and corn. Now add the ground paste, salt and 2 1/2 cups of water and mix it well. Put a lid and let it simmer for sometime. Veggies cook so quickly so make sure to check promptly, it should be toothsome. Mushy vegetables completely change the texture of this salna. By this time you can smell this wonderful aroma fill your kitchen and the gravy is nicely thickened. If it gets too thick add hot water, little at a time and bring it to the desired consistency and keep it in a low flame for just a minute. Never add cold water to a finished gravy. Just to brighten the flavors add a tiny squeeze of lime and garnish it with chopped cilantro leaves. You can serve this with Parottas or with Pilaf , it tastes delicious! Now the salna is ready we have to make the parottas. 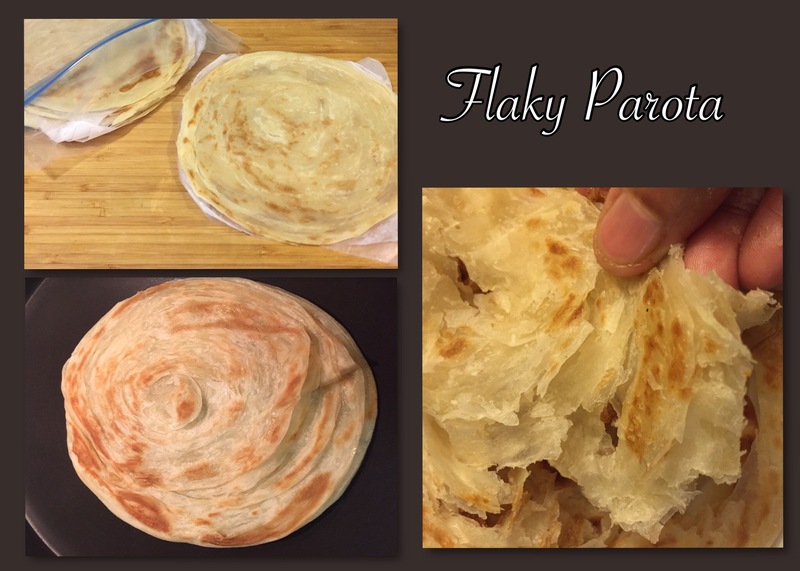 It is a multilayered Indian flat bread made with lots of butter. It is exactly like making puff pastry, Making these at home is little labour intensive so I’m using the ready made ones. These are eggless frozen parottas which is fully cooked all you have to do is to thaw it nicely and heat it up in a hot pan until it gets the golden brown color and serve it hot. It tastes amazing it’s buttery and flaky which tastes so good with the tangy salna. It is always served with a very crunchy fresh onion tomato salad. Let me tell you quickly how to make it. 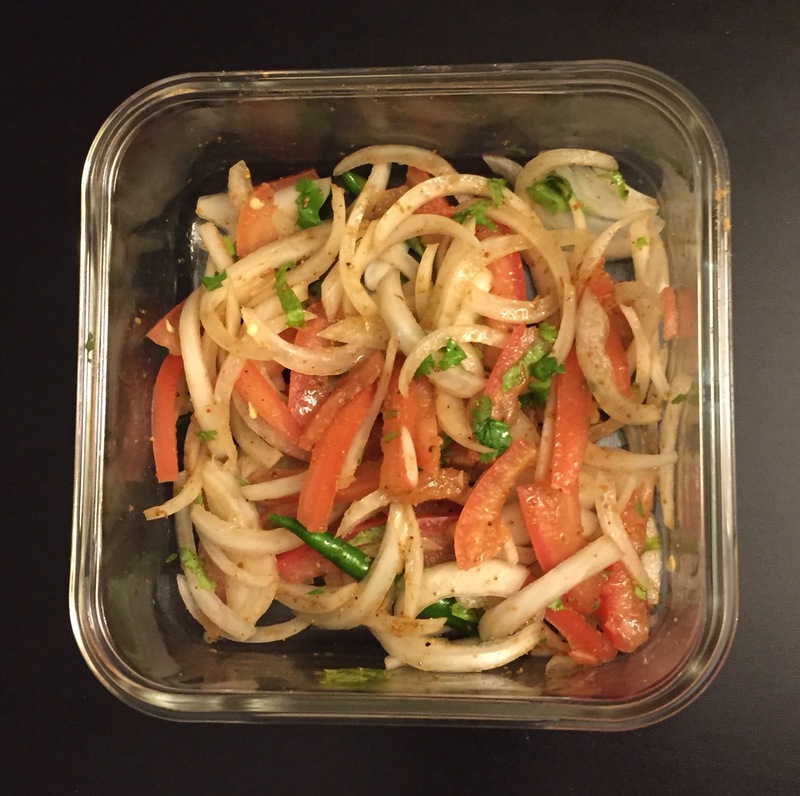 Thinly slice the onion and tomatoes add a slit green chili, chopped cilantro and a teaspoon of chaat masala and mix it well and let it rest for sometime for the flavors to meld. How easy is that ? This salad is very important since it cuts the creaminess of the rich parota and the salna. Don’t add extra salt the chaat masala has black salt in it. Make sure to scoop out the flesh from the tomatoes otherwise it makes the salad soggy. Let’s dig in ! Oh man it is worth all that wait. It tastes soooooo good !. I like to serve a small bowl of plain pulav ( pilaf) on the side which makes this a very satisfying meal. 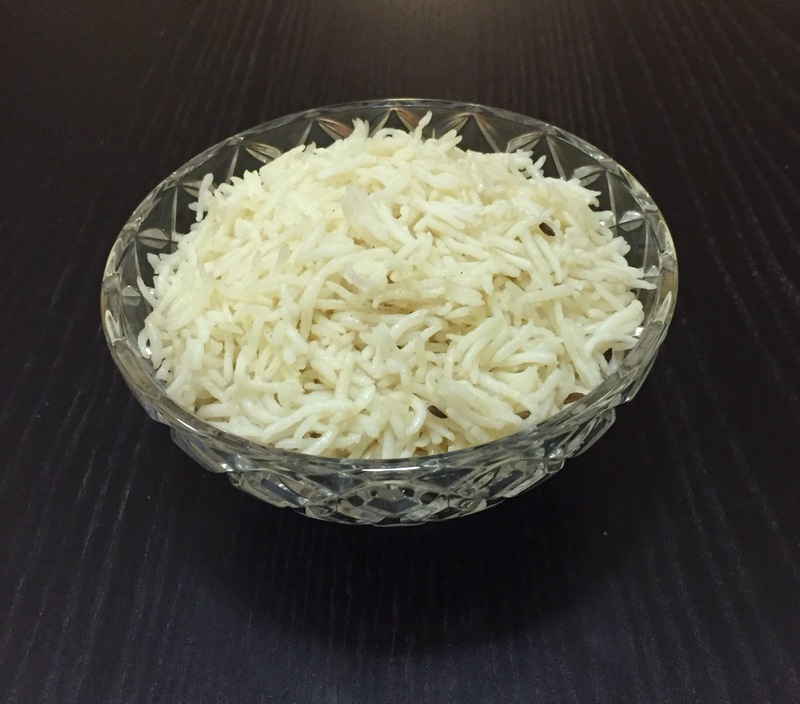 Pilaf sounds very fancy but it is extremely easy to make, it is made with the very flavorful basmati rice. Wash and drain 1 cup of the rice. Heat little bit of oil and butter in a pan add fennel seeds, couple of cloves and cardamom a stick of cinnamon and a bay leaf, toast it for a second. Add 2 cups of water and 2 teaspoons of salt, and cook it in a regular pan or (pressure pan for just 2 whistles) Once it’s done fluff it up with a fork. If you want this to be festive garnish it with a tiny bit of saffron and roasted cashews or almonds. I’ve made it plain since the gravy is rich and has veggies in it. It is great for lunch or dinner. These recipes easily serve a family of 4. Let me tell you what I do with the leftover salna. I toast couple of bread slices with some butter until it’s crunchy and golden brown,slice it diagonally and dip it in the salna and Enjoy ! Mmm …Yummy! It is an awesome snack or a quick breakfast when you are in a rush. So your entire day’s meal is taken care of. Nothing beats the fact that when you get home after a long day of work there is something ready to eat which gives you this big sense of relief. 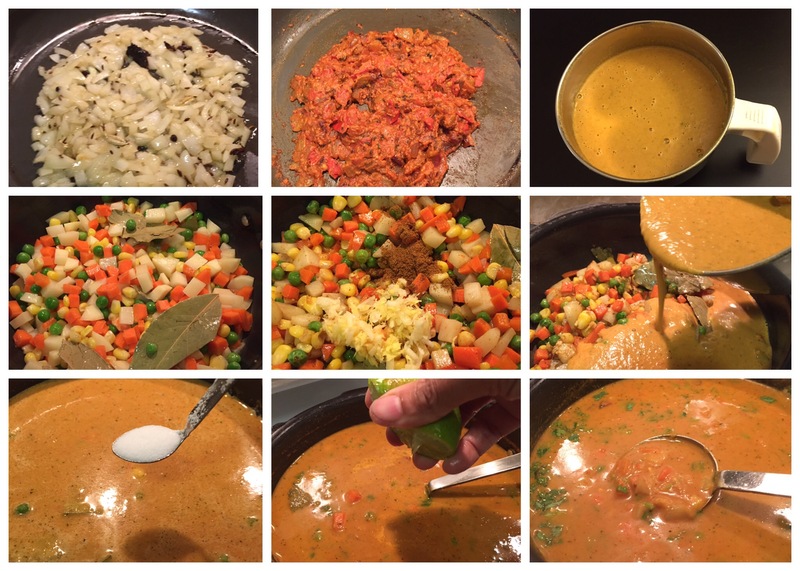 Go ahead guys make a big batch of this and make your work week cooking less stressful. Happy cooking and Enjoy eating ! I seem to be bookmarking every recipe you publish 🙂 Great for a vegan family like ours and I love the clear instructions.